Three of us from mySociety’s international team have spent the last few days in Yangon, Myanmar. We’ve come to visit people we’ve been talking to recently about some potential local projects, but we rushed the dates of our visit so we could be present at Myanmar’s first hackathon. Events like these live or die based on the enthusiasm and energy of the organisers and the participants. 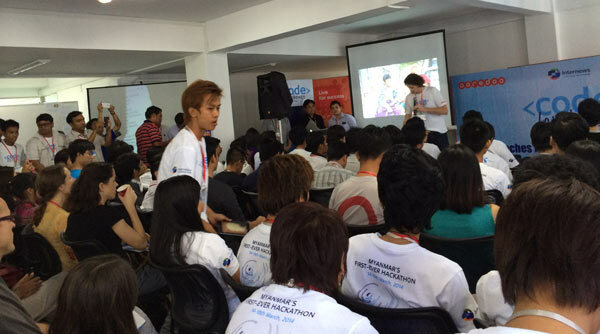 In that respect, this Myanmar hackathon was best we’ve ever seen. The motivation of everyone present was palpable, driven by David’s seemingly unlimited supplies of energy. It’s also relevant that the problems the teams were working on were specific, real ones that had been submitted by local NGOs who genuinely want them to be solved. This didn’t happen in isolation: representatives from the NGOs were available throughout the weekend to ensure that each team understood the problem they had adopted and were building something that met their requirements. It’s not uncommon to see scratchy or shaky products being lauded at the end of hackathons, but that was not the case here. The standard of the teams’ work was unbelievably high. Many produced complete Android apps together with websites and iOS versions too. And while it’s easy to be distracted by the technical achievements, David and his people had been clear about the importance of the three-minute pitches/demos (yes: just three minutes!) that were the culmination of each team’s weekend of work. Participants were coached by the extraordinarily astute Phil Morle of Pollenizer in a series of rehearsals — a form of preparation and refinement that frankly was as valuable to those of us who sneaked in to watch it as it was to the participants themselves. impact: does this make you think “wow”? practical: can the NGO actually use it? creative: has the team done something unexpected? execution: did the team implement it well? pitch: how clearly was the solution presented? The thoughtful organisers also provided other services: real-time English translations during the presentations (wonderful students from UCSY typed furiously into a google doc projected alongside the stage); buses to get back into town late at night; full meal catering; and caffeine that flowed freely from sponsors Red Bull and Nescafe. We helped a little as mentors, asking the teams questions about their direction (we do know a little about user-centred design, after all) and providing enthusiasm and praise. But mostly we spent our time being impressed and inspired by these amazing people as they hacked away throughout the two days. Myanmar is deservedly famous for being a beautiful country of unrelentingly charming people — but in the last few days we’ve been shown that it has tremendous technical capability too. We will leave knowing how privileged we were to be here to see it being demonstrated so clearly and enthusiastically.